2012 is almost upon us and it’s that time when many of us beginning to plan our holidays for the coming year. Where should we go on holiday this year? I used to think about holidays in terms which country would I like to visit? I’ve never been to Russia for example, how about there? Wild flower meadows – I would like to see a different one each year. Something that many people do not realise is that what we consider garden plants actually grow wild in many other countries. Go to Israel and the south eastern Mediterranean around Easter to see meadows full of wild iris and pink cyclamen and red and blue anemones growing under the shade of trees. Visit the mountains of Turkey for daisies, poppies, violets and wild hyacinth. Turkey is said to have more species of wild flower in its countryside than the rest of Europe put together. The island of Corsica is known as the island of flowers where they grow in profusion. The meadows of Colorado in the States are full of vibrant reds, blues and yellows. Each meadow is a colourful tapestry and a thing of beauty. The higher and more mountainous the landscape, the rarer the flowers. All over Europe there are mountains where crocus blooms in profusion at the edge of receding snowdrifts. Go to northern Greece to see yellow crocus or the Tatra mountains of Poland for valleys full of purple flowered crocus. 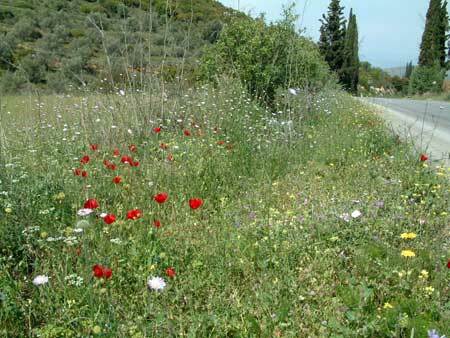 A roadside verge in Greece in May is shown on the right. The very best places to see magnificent displays of wild flowers are the totally unspoilt remote locations. I like to stay in a log cabin or cottage and go out and about for walks of discovery. Views of wild flowers are good for the soul, they instantly calm and present an image of the world as a paradise. Interacting with animals and nature – I have an endless fascination with animals on Earth. I feel that we have not yet developed relationships with anything other than domestic cats, dogs and horses. That relationship developed over thousands of years. We talk about communicating with animals and even where some form of communication is established we don’t think in terms of the animal but ourselves. The dog expressing a wish to go for a walk by bringing us his lead does not always fill us with glee. However, we have to be proud of the fact that British attitude to animals is arguably the best in the world. We do consider the feelings of animals or we wouldn’t support charities that try to improve the lot of working donkeys, performing animals and those kept in poor and cruel conditions. Animals are an important part of our world and I especially enjoy seeing them in the wild. Red squirrels in the Lake District and Scotland, seals on our beaches (Wales, Ireland and Scotland) and wild ponies of Bodmin, Dartmoor and the New Forest all give me pleasure to view. Zoos have a part to play in protecting endangered species, however, one of the best forms of zoo for me is the safari park. We have several safari parks in the UK, all of which allow us to see animals from the safety of our cars. A safari on a game reserve in Africa is especially thrilling when an element of danger is added to the drive. Mind you, anyone who has been through the monkey and bear enclosure at Woburn Safari Park (stay in a cottage in Bedfordshire) has many a tale to tell of their experience and missing car parts. Sea views – I like to be by the sea. Not just anywhere by the sea. You can keep those concrete monstrosities and high rise developments on the coast, my dream is of a crescent of sandy beach backed by pines and hills, where the occasional house nestles. The waves gently lap the shore and the water is crystal clear and there are few people on the beach. This is the kind of sea where I can go snorkelling and spot fish and sea creatures, or swim out to a boat just offshore. My ideal coastal views are natural. 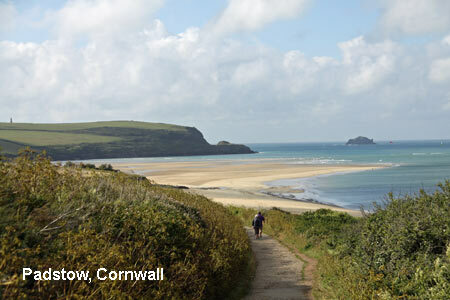 For beaches in the UK, I head to Cornwall or north. We have some of the most fantastic long and deep sandy beaches anywhere. Again, thinking nature and thousands of sea birds, my favourite destinations are remote. All around the rocky headlands of Scotland are rocks and nesting places for birds. Coastal walking has increased in popularity in recent years and the coastal paths of Wales and the south of England are very well developed. Go walking in the north east of Scotland, see the incredible cliffs of Bullers of Buchan near Cruden Bay in Aberdeenshire for a magnifient sight. Or. go to County Cork for the Irish version and seas warmed by the Gulf Stream. There is whale and dolphin spotting off the Moray Firth in Scotland and the coast of Count Cork. Find somewhere to rent for a holiday in County Cork or the north east of Scotland. Take bird spotting books and teach the children to identifiy various species of sea bird and wader. I think 2012 will be a year when people decide to stay in Britain and discover more about their own country. Lots of other people like myself will be be thinking, what would I like to do on holiday rather than simply where shall I go? Decide what you would like to do and that will help you decide where you are likely to find those outdoor pursuits and activities. Take a look at activity self catering breaks if you like to participate in outdoor sports with your children or cottages in rural locations where you can spot wildlife. Perhaps in 2012 we will all try something new and discover something about ourselves and our own country?